Not to be confused with the Scottish munro of the same name, Queenstown’s Ben Lomond is just one of many New Zealand peaks named Ben Lomond. Ben Lomond provides great views over Lake Wakatipu, Queenstown and the surrounding mountains, and makes an excellent daywalk from the New Zealand resort town of Queenstown. The summit is at 1748m however, and in winter you would need alpine skills and experience to get to the summit. 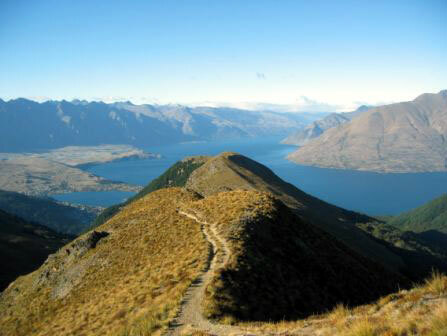 If yoy want to shorten the walk a little, and indulge in the complete Queenstown tourist experience, you can start this daywalk from the top of the Queenstown Gondola. If you prefer to save a few dollars, you can also start from the beginning of One Mile Creek track, which is located at the One Mile Creek roundabout, on the Queenstown-Glenorchy Road. 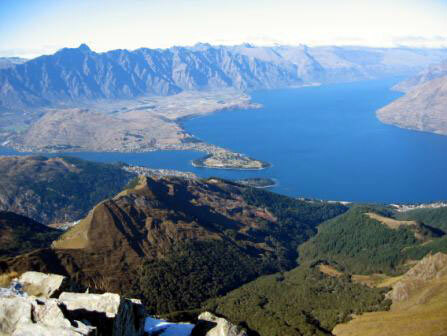 Both the Queenstown gondola and the One Mile Creek roundabout are within walking distance from central Queenstown. Alpine Taxis(0800 442 6666) also provide tour options, as well as a normal taxi service. The section of track from the saddle to the summit is very steep and DOC does not recommend this walk for children under 10 years of age. Parts of the track cross private land. Please respect the landowner?s rights and keep to the formed track to avoid stock disturbance and farm hazards. This is a New Zealand alpine daywalk. There is no water available enroute, and you will not find a cafe at the summit serving beer and spaghetti! 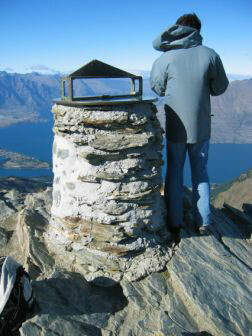 Take plenty of food and water, and warm clothing (even on a hot day) – it can be a lot colder at the summit than in Queenstown. Make sure you have enough daylight hours to complete this 5-7 hour walk. 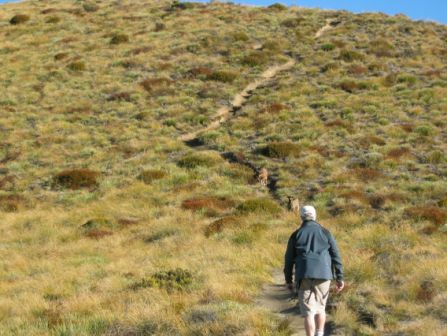 So once you have your tramping party suitably prepared and equipped for alpine daywalk, you can start from either the bottom of One Mile Creek Track, or from the top of the Queenstown Gondola. Starting from the top of gondola (which cuts out a steep climb from the road), paved paths and signs point the way to the Ben Lomond track. You will first travel through stands of Douglas Fir, before emerging above the bushline and into alpine tussock. After passing the signposted junction with One Mile Creek track, you will then head steadily upwards to the saddle (and a seat) (1.5-2hrs from gondola). At this point the track to the summit becomes very steep and rocky, and you cairns guide the way to the summit. After about 45 minutes of clambering up this steep section, the summit provides a plane table and extensive views. Allow 4-5 hours for the return journey from the top of the Gondola, and 6-7 hours if departing from One Mile Creek Track.